Transferring data from Android to iPhone may trouble you for a while if you just switched from an old Android phone to a new iPhone X or iPhone 8/8 Plus. Take it easy! 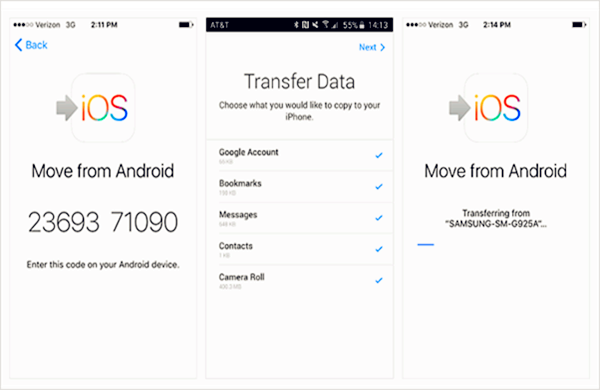 Here in this guide I will show you two effective methods to help you transfer data from Android to iPhone quickly. 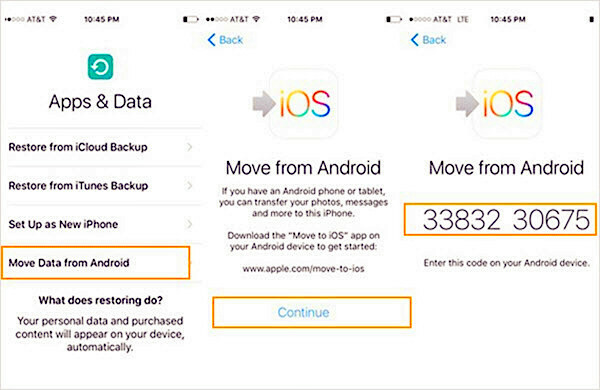 Set up your new iPhone or iPad to reach the Apps & Data screen, then select “Move Data from Android” from the list and tap “Continue” to get the ten-digit code. Connect your Android phone to a Wi-Fi network, then run the Move to iOS app and tap “Continue” to agree with the terms and conditions when it appears. After that, tap “Next” in the top-right corner of the “Find Your Code screen”. Then enter the ten-digit code (displayed on iPhone) on your Android phone. 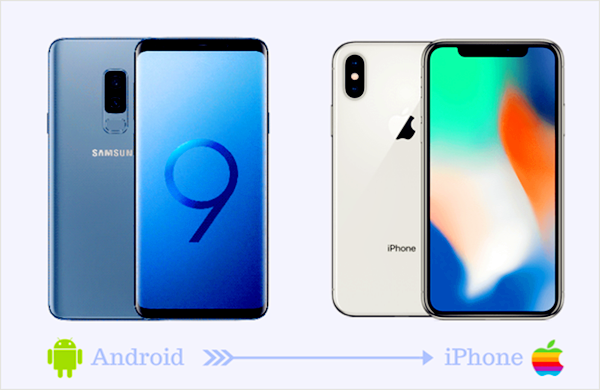 While the two phones are connected together via Wi-Fi, select the file types you want to transfer from Android to iPhone and tap “Next” to begin the process. Once the transfer is completed tap “Done” on your Android phone and tap “Continue” on your iPhone or iPad to finish setting up. Note: If you have already completed the setup process previously, you have to erase all the data on your iOS devices and start over. Besides, this app is only available for Android 4.0 or later as well as iOS 9 or later. Make sure your USB cable is in good condition. Make sure both Android and iPhone are powered on. Install the latest USB Driver for your phone on the computer. Download and install Gihosoft Mobile Transfer Software on your computer. After running it, select the “Phone to Phone” option from the main interface. Then connect both Android and iPhone to the computer via USB cables respectively. Once connected, select files and tap “Start Copy” to transfer data from Android phone. Note: When you connect your Android and iPhone to your computer, if a message box pops up, please tap “Allow” on your Android phone, and then click “Trust” on your iPhone to authorize the program. Move to iOS VS Gihosoft Mobile Transfer: Which One is Best? All those mentioned above are two efficient methods to transfer data from Android to iPhone. Which one do you prefer? It doesn’t matter if you have no idea of it yet. Next, I will analyze the advantages and disadvantages of the two apps for you. You can choose the best one for you based on your own situation. In terms of moving from Android to iOS, the best choice may be Move to iOS. It permits you to transfer data from Android to iPhone directly via Wi-Fi connection. However, comprehensive consideration, Gihosoft Mobile Transfer could be the most correct choice. 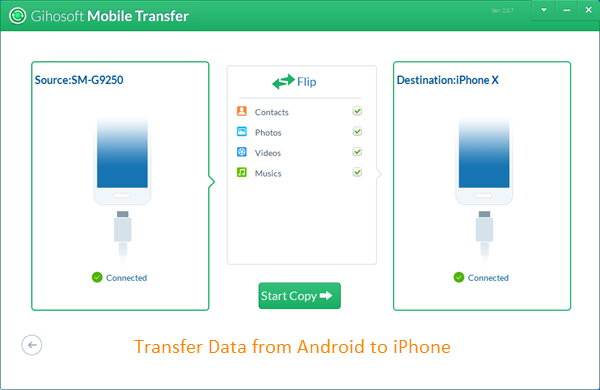 This phone data transfer software can not only enable you to move data from Android to iPhone but also allows you to transfer data from other combinations of supported devices such as Android to Android, iPhone to iPhone, iPhone to Android, iTunes to Android, iTunes to iPhone, etc.